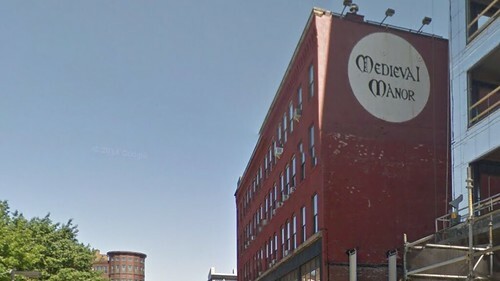 After 43 years, a Boston dinner theater institution, Medieval Manor will be closing its doors; the last performance will be New Year’s Eve 2015. Located in an area of the city that was previously pretty high crime, but now has a giant Whole Foods, it seems that interest in eating with your hands and bawdy/vaudevillian style entertainment has waned. Also, you know, property costs have gone absolutely insane, so lots of people and places are being priced out of the area. 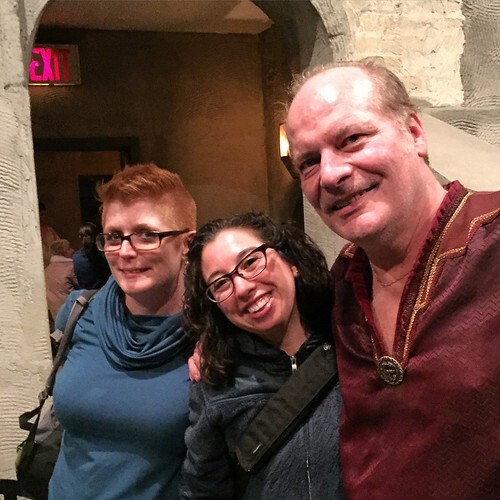 Despite all the Ladies being lifelong Boston area natives and fans of experiences that are outside the norm...most of us had ever been to Medieval Manor (yes, I know, this makes us part of the problem). So, thanks to the enthusiasm and coordination skills of Lady pal Bree, The Red Menace and I (along with honorary Lady, The Goog) got ready to dine with royalty, and knaves, and to hike the Canterbury trail. 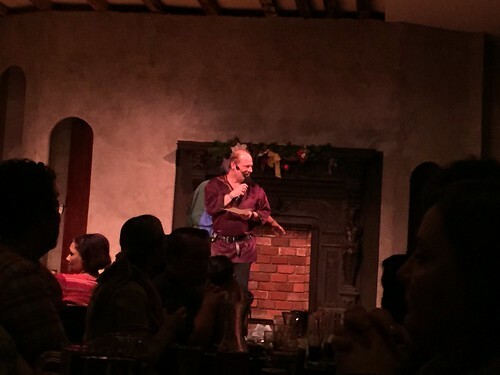 The thing about going to a place like Medieval Manor is that it's definitely more fun with larger group, and there is an expectation that you are celebrating a special occasion (our group was just celebrating life and that was ok too). The night we went there were engagements, a woman celebrating her 88th birthday, and a 60 person large Rocky Horror Picture Show cast reunion. This Rocky Horror cast had been coming for dinner once a year for many years...this was a bittersweet homecoming for them as it would also be their last gathering there. Generally most attendees were wearing regular after work or going out clothes, but a few were dressed in Ren Faire style costume. Dinner- Dinner is served family style and in courses. While there is just about something for everyone, it's probably a bit tougher to be a vegetarian. The meal starts with appetizers of bread and cheese, and mussels. 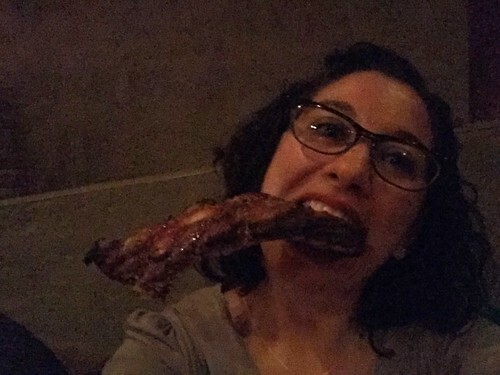 Then comes soup and salad, and two meat courses-a giant beef rib, and a chicken leg with thigh. 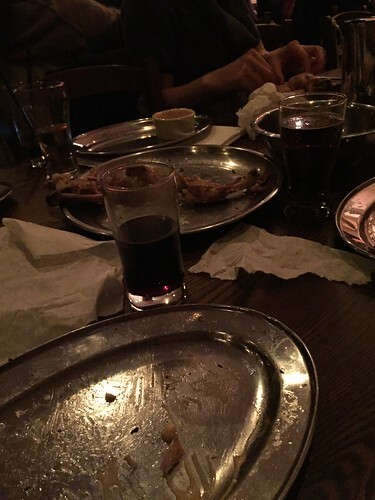 It's actually a lot of food, which is good because the cheap wine and beer flows pretty freely, thanks to our wench Heidi (note: wench is her occupation, not her name, so please address her as Heidi). I'm not being insulting by calling it cheap - our server was sure to tell us it went into the box only the week before, so it was nice and fresh. 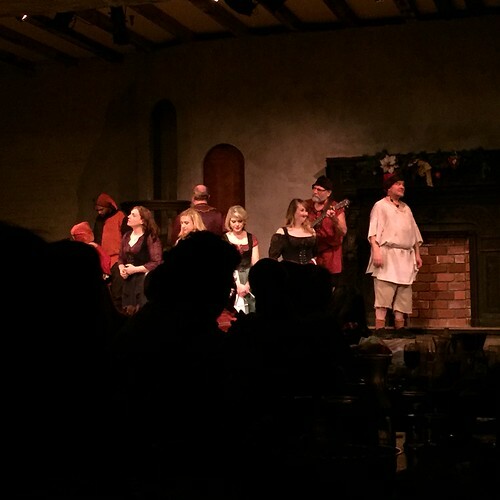 Very much dinner theater, the servers also double as members of the court and are often on stage during the entertainment portions of the evening. Don't worry, they make sure your wine and beer flagons are full before the next act. As the King presides over his court and rules the room for the evening, there is singing, banter, comedy, and a few audience participation moments. Particularly hilarious is the joust that pits a male and female audience member against each other to joust with baguette bread loaves held between their legs. While the male representative was Lady friend and tablemate Blake- and we cheered for him mightily - the women prevailed! Our prize? Getting to travel the Canterbury trail whenever we wanted, which translates to getting to go to the ladies room or outside without needing explicit permission from the King. This is actually a pretty good thing considering the aforementioned flowing cheap beer and wine. 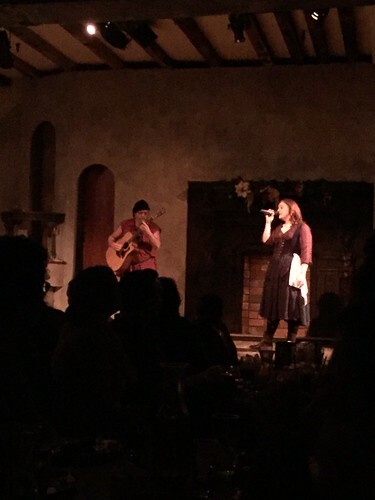 Because it was close to the holidays, we were also treated to a lovely Christmas medley. Lovely and nerve-wracking since Bree, The Goog, and I were all participating in the Little Drummer Boy Challenge this year. We survived the floor show, though The Goog and I did get taken out by an episode of Arrow a few weeks later. 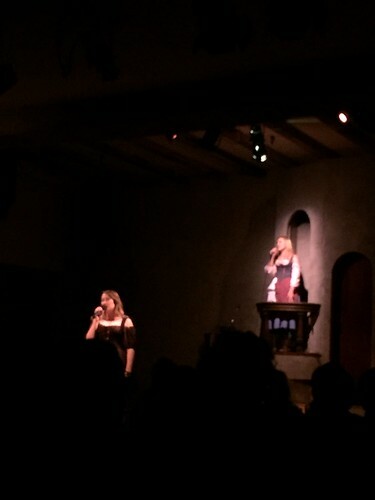 Final thoughts- While dinner theater is generally not my thing, this was a great night and we had a super fun time. We were actually pretty disappointed in ourselves that we hadn't gone sooner since this was our only and last chance.